It has been a treat for me when the rainy season starts-up in south Florida, because the local Barred Owls will hang out at night at the water treatment plant were I work. Well they have returned to visit with us again as the seasonal rains begin. They will hang around until September-October, when the weather dries up. Recently Charlie Ewell posted that the Cape Coral Eurasian Wigeon was still to be found on its pond on Del Prado. Had expected that the duck would have been drawn northward to seek a mate. I suppose it is possible that it has bonded with a resident Mottled Duck, which are not migratory. I did check the pond last Monday and found it in the company of several mottled ducks, mallard-mottled duck hybrids and several pekin ducks. A Pied-billed Grebe was also on-site. Maybe the wigeon will stay the summer. Tuesday I birded Babcock-Webb in Charlotte County. I quickly located the Big Three - Red-cockaded Woodpecker, Bachman's Sparrow and Brown-headed Nuthatch. Other interesting sightings included Eastern Bluebirds with their fledglings, a Sandhill Crane with a colt and a late Eastern Kingbird. After visiting Babcock-Webb I elected to retry for the Tropical Kingbird at St Armand's Circle in Sarasota County. Seems that it frequents the parking lot area mat Adams and Monroe Streets. Here we have another vagrant in the tropical kingbird, who seems uninterested in migrating to its normal breeding range. It has been posited that this individual has been on-site here since back in 2013. Tomorrow I am going to participated in Michael Brother's sponsored pelagic birding trip out of Ponce Inlet. Michael is director of the Marine Science Center in Ponce Inlet and sponsors three or four of these trips a year as fund raisers for the Center. This trip was scheduled to travel, aboard the 'Pastime Princess', a hundred miles out into the Atlantic to the eastern edge of the Gulf Stream. Lots of pelagic bird species were expected including white-tailed tropicbirds. I got to see one on last years trip. Today I am driving over to the East Coast, but first is a required stop near Longboat Key in Manatee County to locate a reported Bahama mockingbird. I arrived at Leffis Key around 2 pm and joined with three other groups of birders seeking both the vagrant mocker as well as a reported black-billed cuckoo. For an hour we searched without success for either bird. We did get a yellow-billed cuckoo and noted at least 60 Magnificent Frighatebirds soaring above. The mockingbird appears to have been an easy sighing for many observers including my friend Dr Padilla who photographed the bird early this morning. Arrived dock-side at 2:30 am after a short rest in my hotel room. We have forty-three participants plus the trip leaders heading out today. But there is some bad news. The weather conditions, though were expected it to be nice, are actually a bit windy. The sky will be clear and the temperature somewhat comfortable. But the seas will be too rough to venture out past the Gulf Stream. This will effect the quality of the day's birding. Heading out on time we slowly pass through the inlet, were the first bird of the day for me was Black-crowned Night-heron staking out a spot at the draw bridge. We soon enter the Atlantic and travel east for forty or fifty miles. Come dawn the search for pelagics starts. But it is a slow start. A few unidentifiable phalaropes are spotted cruising low above the waves. And eventually the chum-line attracts a few birds. First to appear are a couple of Black-capped Petrels. Then we see a steady show of Wilson's Storm-petrels. A band-tailed storm-petrel and an audubon's shearwater are seen, but not on our side of the boat. We get to see a single Cory's Shearwater and a Lifer for me in a Sooty Shearwater. An Artic Tern and a Pomarine Jaeger put on a show circling the boat. We stayed out on the water till late afternoon before heading back to the dock. Our counts aren't very high. Dipped on tropicbirds and few other targets, but we did get a few very good birds. As we travel west toward shore a few Common Terns pass by. We originally called them sooty terns, but photographs determined that they were actually common terns. Its kinda nice to have instant replay while birding. Later a pair of juvenile Northern Gannets pass behind the boat. Only other marine life we encountered was a loggerhead turtle or two and a few dolphins. As for fish, there was a claim of a sailfish following the chum-line, but I only really saw were the flying fish bouncing atop the waves. Today was a travel day with options on were stop to done some more birding. 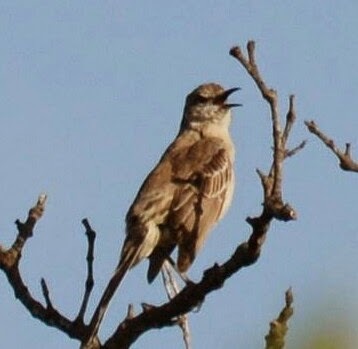 I elected to head straight back to Leffis Key for the bahama mockingbird. Got there about one pm and again dipped on the bird. I do believe early morning is a much better time to arrive. I did get a Lifer in a pair of Blue-crowned Parakeets at nearby Ann Marie Island. Next stop was at the Celery Fields. Best birds there would be the Black-bellied Whistling Ducks and a Limpkin. Then home for some rest. Some shore birds are still passing through our area from, South America, on the way to breed. 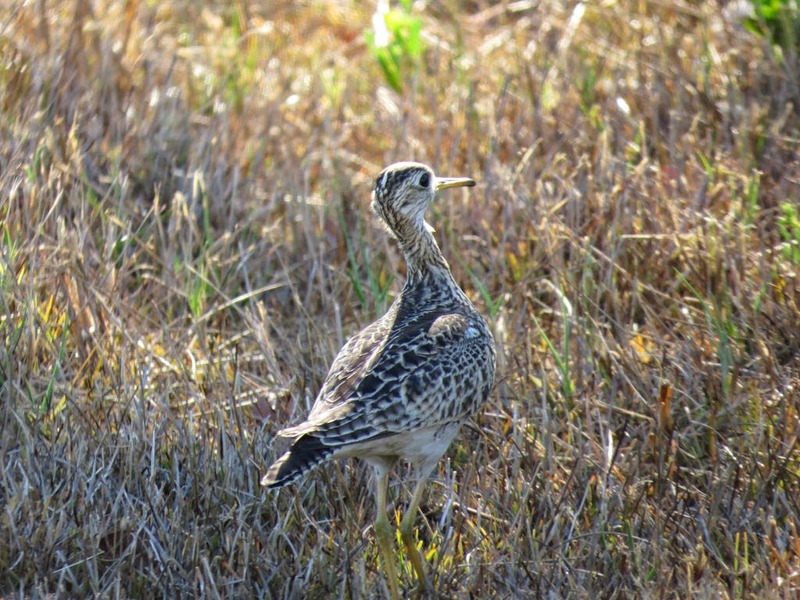 Such as an unexpected sighting of Upland Sandpipers. We don't usually encounter the species locally, but just yesterday Dr Padilla reported resighting an uplands, first seen by Keith Laakkonen on Monday on Big Hickory Island near Lovers Key State Park in Bonita Beach. I twitched after it and dipped, but it was seen by several birders. Another migrant I dipped on were bobolinks. For the past three years they could be found at Harns Marsh in Lehigh Acres on or about May 1st. This year I visited the marsh eight days in a row in search of the birds. But they were a total no-show. A few were seen earlier at Ding Darling on Sanibel Island. Reports on ebird noted that the Celery Fields up in Sarasota was the place to seek them out this year. Just as my records showed May 1st as a good date, they also show that on or around September 30th they should be passing us on there way south to Argentina. Will have to try again later. A few neotropical migrants are still passing through. Found a Scarlet Tanager at Six-mile Cypress Preserve the other day. A couple of days ago I found a trio of Ruby-throated Hummingbirds frequenting the butterfly garden at Bowman Park on Ft Myers Beach along with a having a Yellow-billed Cuckoo pop-up.There is still time to find a few more migrants at our local hotspots. But the action is definitely shifting to the north.